The blackness of his obliterated vision has made a fertile screen for his daydreams, and they have intensified during the last years. There he finds treasured smells, and tunes he has whistled, and other remnants that are lustered, now, with the mauve of nostalgia. He pictures the strange offspring that might have grown out of a man like him, whose blurred faces float among rows of lamps strung like greenish pearls in the darkness. He forgets that his own son, if he is still alive, would now be over seventy, and he dreams of strong young people filled with courage he never had. He pleasures himself with implausible tableaux of revenge, and sometimes he can see himself in the streets of New York, as clear as day. The book is organized into two sections, or “Movements.” The first, “Life,” is basically the story of Ulrich’s own life and of 20th century Bulgaria as he experienced it. I love to read books about people living in places and times different from my own, although such books can be a challenge, as I’ve noted before. 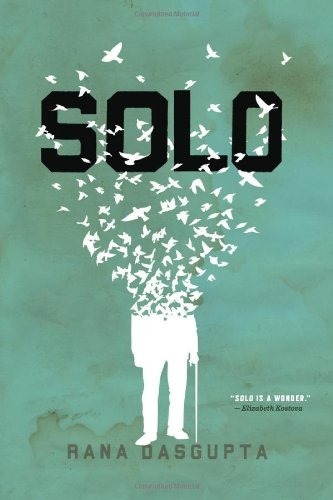 Ulrich’s tendency to distance himself from the major events of history actually made the transition into the world of Solo a bit easier than it might otherwise have been. It also made the story feel more real. So often, historical fiction puts its characters right in the hot seat, even making them active agents in the events we read about in history books. I tend to think, though, that most people just let events happen around them, just as Ulrich does. I believed in this man, and my heart broke at seeing how the combination of circumstances and temperament left him so alone. The second movement, “Daydreams,” recounts the stories Ulrich makes up as he sits alone, stories of those “strange offspring that might have grown out of a man like him.” There’s Boris, the violin prodigy; Khatuna, the beautiful young Georgian women who takes up with the gangster, Kakha; Irakli, Khatuna’s beloved brother, a poet who struggles to find his words; and Plastic, the New York record producer looking for the next big thing in world music. I’ve seen this last half of the book described as a story cycle, but actually it read to me like a single story, just one with a chapter-length introduction for each character. This day-dreamed story is filled with melodrama. Ulrich’s imagined offspring become bigger than life. There are moments of love, of significance, of monumental influence, but they are fleeting. Their lives are no happier than Ulrich’s, but they’re different—epic. As Ulrich explains it, “Life happens in a certain place for a certain time. But there is a great surplus left over, and where will we stow it but in our dreams?” It stands to reason that Ulrich’s small life would have a massive surplus and thus lead to massive dreams. Each of the two halves of this novel could just about stand alone. Dasgupta’s prose is strong and evocative, with only occasional trips into fussy and overly poetic territory. The characters are not necessarily likable, but they’re interesting and I ended up caring about most of them, even when I found their behavior vexing. What makes the book really fascinating, though, is the juxtaposition of “Life” and “Daydreams” and the gestures near the end of the book that draw these two movements together. Ulrich says, “There is far more to us than what we live,” and this story, organized as it is, challenges our usual notions of what makes life worthwhile. I have this book but haven’t had a chance to read it yet. Lots of people have said they really liked this so I’m looking forward to it. I was definitely impressed. Hope you enjoy it! I recently read James Wood’s review of this book in the New Yorker and was intrigued enough — just — to write down the title and author. This post adds to my interest! Great! I’ll have to look for Wood’s review. I hope it’s okay if I add a link to your review to the South Asian Review Database. Hope you enjoy! And please, feel free to link away.